Many thanks to Worthing Museum and Jane Austen House Museum for their advice and support. During her stay in Worthing in late 1805 Jane Austen became friends with Edward Ogle, who was the driving-force behind the chaotic little town’s transformation into a well-ordered seaside resort. 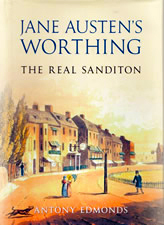 Then, in 1817, the year of her death, Jane Austen used Worthing as the background for her final, unfinished novel Sanditon, one of whose main characters was based on Ogle. Jane Austen’s Worthing: The Real Sanditon gives a detailed account of the town Jane Austen knew in 1805, and explores in full the close links between Sanditon and early Worthing. But this book is more than just the snapshot of a single year. It is also the portrait of an era. Taking the first twenty-five years of the nineteenth century as his time-frame, Antony Edmonds explains how Worthing changed and developed during this period, and paints vivid pictures of some of the people associated with the town. We meet Worthing’s most paranoid resident, the volatile reformed criminal John Mackoull, and some notable visitors, including the poets Byron and Shelley, the satirical writer Horace Smith, and Colonel Berkeley, the louche nobleman and part-time actor with a passion for young actresses. The book has over seventy illustrations, more than a third of them in colour, and includes maps of the town as it was in 1805 and 1814.